Cazenovia College joins artists, organizations and institutions in over 20 countries to celebrate sculpture. Cazenovia, NY (April 3, 2017) – Cazenovia College will partake in the upcoming International Sculpture Day (IS Day) on April 24, 2017, featuring the work of Tadashi Hashimoto, Grounding Sky, on display in the Sculpture Court at Reisman Hall, located at 6 Sullivan Street in Cazenovia, NY. International Sculpture Day is an annual celebration held worldwide to further the mission of the International Sculpture Center (ISC), which is to advance the creation and understanding of sculpture and its unique, vital contribution to society. For more information about IS Day, go to: sculpture.org/isday. Members of the community are encouraged to view Tadashi Hashimoto's sculpture featuring geometric forms to bring about the articulation of gravity, motion, space and light. He paints various sides of the geometrically ordered rectangles in tones of blue, reminiscent of the sky. The sculpture's angles and spaces capture a variety of light and shadow situations, enclosed and exposed. Hashimoto augments spatial and surface relationships, creating interactive tonalities of blue reflecting throughout and beyond the sculpture. 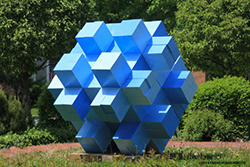 He sees this outdoor sculpture as a conductor for sunlight with the blues of many surfaces creating a connection to the sky and to the implication of the Earth and existence. For more information about Tadashi Hashimoto, go to: tadashihashimoto.com. The ISC is a member-supported, nonprofit organization founded in 1960 to champion the creation and understanding of sculpture and its unique, vital contribution to society. Members of the organization include sculptors, collectors, patrons, architects, developers, journalists, curators, historians, critics, educators, foundries, galleries, and museums—anyone with an interest in and commitment to the field of sculpture. For more information, go to: www.sculpture.org. ISC publishes Sculpture an international, monthly magazine dedicated to all forms of contemporary sculpture. It contains provocative criticisms, knowledgeable technical discussions and timely exploration of new materials and techniques. For more information, go to: www.sculpture.org/redesign/mag.